"This recipe was handed down to me by a Korean friend. So full of flavor! I wanted to share it with you all. I did tweak it a little to add more spice. Feel free to tweak it yourself!" 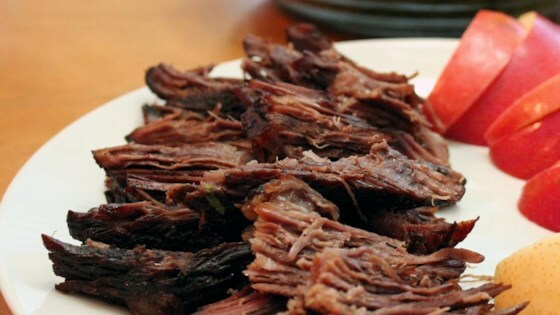 Put chuck roast into the crock of a slow cooker; add onion, brown sugar, soy sauce, garlic, jalapeno pepper, ginger root, rice vinegar, sesame oil, salt, and pepper. Cook on High for 8 hours (or on Low for 10 hours). Shred meat with a pair of forks and stir into the liquid in the slow cooker. Serve with corn tortillas and your favorite toppings. This recipe was handed down to me, and I tweaked it a little by skipping the ginger and diced jalapeno. Instead I used 2 tablespoons garlic-chili paste from the Asian isle at the grocer. Depending on how spicy you like you may add more. We love spice! Also, for the the topping I added a shredded bag of cole slaw, thinly sliced cucumbers, and carrots, tossed in 1 tablespoon soy sauce and 2 tablespoons rice vinegar, with salt and pepper to taste. This was a GREAT dinner! My husband loved it. I made a Chipotle Aioli,Pico De Gallo and added Queso Fresco and served them on warm corn tortillas. Very good! I will be making these again! This recipe was a hit in our house. I served mine in lettuce wraps with white rice. One of the few recipes guaranteed to satisfy all four kids.